Singareni Collieries Company Limited (SCCL) officials given the SCCL Medical Officer Recruitment 2018. The officials mention 30 vacancies for General Duty Medical officer post. The application starting date is 23 July 2018. Interested candidates should apply before the last date 04 August 2018 through their official site @ www.scclmines.com. We provide the educational qualifications, Age limit, Salary, and Application fee details of SCCL Recruitment. The application mode is online. Candidates should check info and apply for this Singareni Collieries Company Limited notification. For more details regarding the Singareni Recruitment, read the full article. 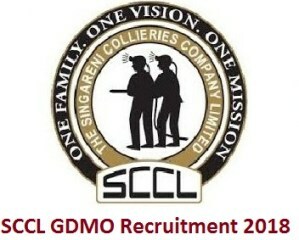 SCCL Recruitment 2018 issued on the official site of Singareni Collieries Company Limited (SCCL) . The SCCL Board is ready to recruit the candidates based on their performance. The officials of SCCL released a notification for filling the 30 Medical Officer vacancies. Candidates should check the eligible details in our page and then start applying for the notification before the date expires. The closing date to submit the application is 04 August 2018. So, candidates, who are waiting for this SCCL Medical Officer Recruitment, they have the wonderful opportunity to apply for this SCCL GDMO Jobs. Aspirants who are completed the mentioned educational qualification, they are eligible to this Singareni Recruitment. Contenders whose dream is to get a job in Singareni Collieries Company Limited board they should have the qualifications that are given below. Candidates who are born and raise in Telangana state and waiting for a government job, for those aspirants the government of Telangana announced 30 GMDO vacancies. For the latest employment news follow our site. The officials of SCCL declared for SCCL Recruitment for 30 vacancies of General Duty Medical Officer posts. Candidates who are interested to apply this SCCL notification they can check the education qualification, Age limit, Pay Scale, and application fee. Applicants who want to apply for this Singareni Jobs vacancy they must have completed their PG degree/Doctors having Post Graduate Qualification/Specialization with minimum marks. The officials decided to conduct the written exam to the applicants of these 30 General Duty Medical Officer posts. Job hunters having the age limit of maximum 45 years are preferable. Here we provide all the information along with the application process. Candidates should gather the information like SCCL Medical Officer Recruitment application links and application fee, Selection process which are mentioned below. The SCCL team mention the important note that they pick the candidates based on their performance in written test/Personal Interview. Candidates should apply for this job through online only. Here you in download the syllabus and prepare for the exam. Application Starting Date 23rd July 2018. Closing Date 04th August 2018. Candidates can be completed their PG Degree, Doctors having Post Graduate Qualification/Specialisation with minimum marks. No Fee for SC / ST. Applicants, to enrol their name for SCCL GDMO Notification 2018, we have updated the application links in our site. Interested candidates should check the details and start to apply for Singareni Recruitment online. You can apply for SCCL Medical Officer Recruitment through our website. In our site, we are giving application links that will be more useful to the contenders. We provide the application procedure with a pin to pin description. Candidates can go through the official site @ www.scclmines.com. The Education Qualification for this General Duty Medical Officer post is PG degree/Doctors having Post Graduate Qualification. The salary that is mentioned by the SCCL board is Rs.20600-46500/-. Candidates should apply for this SCCL MO Recruitment before the deadline. Here you can download the previous papers regarding the SCCL Recruitment. I had finished my rotatory internship recently, my father works in sccl as mining sardar , my question is any possibility of getting job in sccl mines to work as doctor.